Some of my favorite Lenten music is from the Benedictines of Mary. You can find them on Apple Music, Spotify or their website. It’s Ash Wednesday again, and if you don’t have plans tonight I’d like to invite you to join my family at St. John’s Episcopal Church for the imposition of ashes and celebration of the Holy Eucharist. (I’m working all day and can’t make an earlier service.) We’ve come to another Lenten Season, a time of reflection, repentance, sometimes rededication. But, why ashes? I think it’s fair to say that most of us don’t think about our death each day. And really it’s probably healthy for us not to be too focused on our impending deaths. Once in a while though, it’s good and it’s healthy to remember that our journey here on earth needs to be made with intention, and it needs to be made in view of the end and the destination of our journey. The ashes remind us in a very tangible way that our bodies are not eternal. The imposition of ashes and the words that are spoken in the services every year on Ash Wednesday remind us that our bodies will be a memory one day. Yet, we are also reminded that we are eternal beings, linked to the divine for all times. These shells, our mortal bodies, have meaning and purpose, but also have a timeframe in which they operate. With this in view we begin a another 40 day journey of reflection, of introspection. We begin a 40 day journey of looking over our lives and dreaming about what our lives may yet become. This is a journey that is taken in prayer, fasting and often with extra time built into each day for study and meditation. Lent can be an important time of spiritual reset, emotional strengthening, intellectual inspiration and much needed rest from the diversions that plague us and fatigue us throughout the rest of the year. Our lives are often long and they are sometimes short. Our lives are marked by ups and downs, and our lives are often spent learning lessons and trying to remember the things we’ve been taught. Like the ashes which will wash away when you get home, or the next time you take a shower, our lives have a beginning and an end. The beginning is set for us, and is out of our hands. The end is also often provided for us without a lot of input from our wishes, desires or ideas of timing. But all those in-between days are the open fields in which we run, they are the canvases upon which we paint, and they are the paper upon which we have the opportunity to help write our stories. I bless you in this Lenten season. And I ask you to bless me. May we each be reminded in the best way and the most healthy way that we are not eternal upon this earth, but our lives are still pregnant with meaning and infused with God’s presence, God’s will and God’s love. Reflecting upon these things, it is my prayer that in the next 40 days we will be able to go deeper, deeper as individuals beloved of God and deeper together as the family God has made upon this earth. Oh, one last thing… I was asked if I would preach the sermon this coming Sunday night at the 5 PM service, February 14. If your Valentine’s Day plans will be concluded by five, I’d invite you to come worship with us at St. John’s Episcopal Church in Bethesda, MD. It’s a blue jeans and sweatshirt kind of service, and an inclusive congregation that welcomes you as you are, so please feel a full and a complete invitation to come be with us. This entry was posted in Devotional Thoughts, Lent and tagged Fasting, Lent, Reflection. Then he said to them all: “Whoever wants to be my disciple must deny themselves and take up their cross daily and follow me. For whoever wants to save their life will lose it, but whoever loses their life for me will save it. What good is it for you to gain the whole world, and yet lose or forfeit your very self? If any of you are ashamed of me and my words, the Son of Man will be ashamed of you when he comes in his glory and in the glory of the Father and of the holy angels. In Christian-speak there are some very common and beloved phrases. For those not raised in Christian circles the words can be confusing, and even for those raised in the world of church, we can get them a bit confused as well. 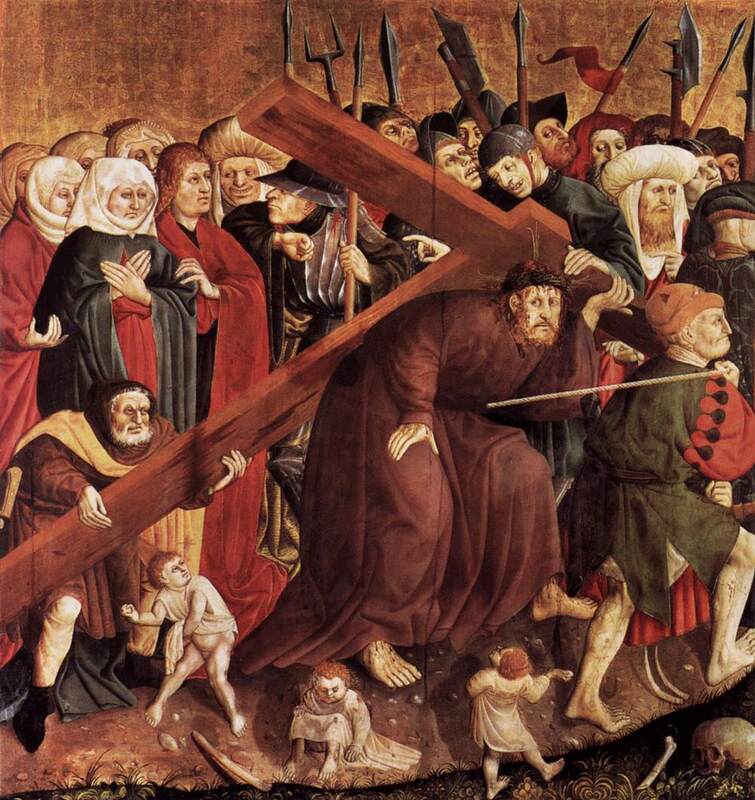 It seems to me that “carrying my cross” is one of those that is in danger loosing it’s meaning. I think it happens when we start mixing metaphors in our heads. Jesus said that those who follow him should be willing to “take up their cross” and then follow. Later Paul will write about his “thorn in the flesh” (2 Corinthians 12:6-10) that he has come to view as God’s chastening in his life. It’s a short step to move Paul’s thinking over to the words of Jesus and suddenly have the “cross I bear” viewed as the minor to major irritations of life. I can only imagine that the seemingly flippant references to carrying their cross that some Christians make reflect this mistake. I hear Christians say, “Oh, that’s my cross to bear” and I wonder if they don’t actually mean it’s what they feel as a “thorn in the flesh.” They might be reflecting on a naughty child, an illness or some other frustration of life. To begin gaining some clarity, let’s start by looking at the cross that Jesus carried. What is the cross of Christ not? The cross of Christ is not a cross of annoyance. It is not a cross of condescending tolerance. It is not a cross of the righteous one’s sensibilities being bruised by the sins of one’s egregious neighbors. The cross of Christ is not the things about our society that I don’t like. It is not the quirks of my neighbor’s behavior that offend me. The cross of Christ is not a President of the other party being elected. It is not my loss of political power. It is not what I don’t like about the world, my neighbor, my workplace, current legislation, my family, myself or my school. What is the cross of Christ? It is a cross of forgiveness. It is a cross of love. It is a cross of sacrifice for the undeserving (us). The cross of Christ is when Jesus intentionally lost so others could win. The cross was painful, so painful that Christ prayed he not have to carry it. The cross is an intimate view of murders, accomplices, thieves, mobs that called for blood, and of the beloved. The cross of Christ was Jesus daily touching the untouchable, eating with the unsociable, rejecting religious elitism and pride, denying political aspirations, and of renouncing his personal rights. So then what is the cross that we are compelled to carry? Looking back at the text I believe it is a very personal thing, a very real dying to self. It is a daily thing. It is a decision made day to day to live a certain way, and from the text it seems clear that the “way” is to choose losing as Jesus did himself. The cross we carry is not the secret moral victory that we grasp close our breasts and nurse through the dark nights of the worst the world might throw at us. The cross is the daily decision to deny oneself and move in sacrificial love and forgiveness, sincere love and forgiveness for those who may or may not be at all deserving. The cross makes us look like losers. The cross identifies us with losers. It is not easy. It is certainly not flippant. I would hazard a guess that when we make the cross into our “thorn in the flesh” we make the dire warning of Luke 9 become a reality, “For whoever wants to save their life will lose it, but whoever loses their life for me will save it. What good is it for you to gain the whole world, and yet lose or forfeit your very self?” I think that if I make the cross into my thorn in the flesh then I would be placing myself at the center, and I would be deciding that the world’s evils are meant against me. I would run the risk of placing myself above all others in my inmost heart and secretly saving my own self while the cross loses it’s sincerity or even stands forgotten in the corner. In an odd way, I would be making the world mine, and holding it accountable to me, so as to save myself. Jesus did marvelous things for us when he taught using symbols and metaphors. In Luke 9 he is speaking of his coming death, a physical death on the cross. The cross toward which he walked was horribly real and deadly tangible. Our cross in contrast is a decision of the heart, but may lead to the same very real loss of self in driven service and sacrifice for others. Choosing to carry the cross is less a matter of choosing to follow Jesus as it is an expectation of those who have chosen to follow. By using the image of the cross and our daily choice to carry it Jesus invites us to join him in this divine sacrificial way. And honestly, I can think of few other ideas less suited for flippant usage. Here’s the bottom line for me: It is a necessary step for anyone coming to Christ to move from the personal experience of spiritual salvation and victory in their own life into the spiritual way of service and offering. If I don’t make that move, then I remain a perpetually self-centered seeker of new victories and greater personal satisfaction. Carrying my cross then becomes my banner and slogan of victory instead of sacrificial love and offering of myself. Though we celebrate the cross of Christ for all it means to our lives and souls, our own choice to bear the cross is no less deserving of some sleepless nights praying in a garden alone. Metaphor it may be, but slogan is it is not. 1) The cross that I carry is not a test or sign of discipleship. Jesus said that my love for others was the sign of my discipleship in John 13. 2) The cross that I carry is not a matter of conversation. There’s no need to say I’m carrying my cross, it should be self-evident. 3) The cross is not my decision to follow Jesus, it is the reality of my life in the following. The moment I begin to look upon the world from any height of pride, scorn or condescension, I am not looking down from the cross. The divine sacrificial way is one of driven love, of forgiveness, and of losing so that another gains the victory. Do I have thorns? Sure I do. I lost my hair for one thing. And believe me, I’d probably be one vain son of gun if I had a wavy, handsome quaff. I also stutter. I struggle with th’s, especially when th’s come anywhere near s’s and z’s! So saying “Nazareth” correctly is very hard for me. Not being able to say to Nazareth easily is kinda rough on a preacher, huh? If I’m not really concentrating it becomes “Jesus of Natharess.” We all have thorns, whether in exactly the manner St. Paul spoke of or not, and I’m way more comfortable making jokes about thorns than crosses. It’s valid to ask if I am just taking time out of the day to condemn or judge someone’s use of “carrying my cross.” Am I just looking for someone or something to peeve about? I’m not really looking to judge as much I’d really like to clarify. I’m less interested in condemnation than I am in reflection. I think that more than ever, as our country truly becomes a pluralist society, we who know the Christian-speak need to stop and slow down, and think about what we are saying and if we should even be speaking at all. Some of our cultural idioms might need some time off, or permanent retirement. Carrying one’s cross is not a conversation, but a way. It’s a needed way to live, love, serve and make an offering of our lives. We owe it to our Lord, to ourselves, and to our neighbors. The world needs us daily taking up our cross, as do our families, friends and neighbors. This entry was posted in Devotional Thoughts, Just Life and tagged Carrying One's Cross, Christian Speak, Cross, Cross to Bear, Offering, Reflection, Thorn in the Flesh, Way.